I hope you all had a wonderful Christmas with your family and loved ones and that it was not too stressful if you were the one in charge of feeding the masses. We always end up with loads of turkey and ham/gammon leftovers and whilst cold cuts are delicious for maybe one or two sittings, any more than that and one craves for variety. I felt a good old fashioned pie would be the perfect way to use up some of the leftovers and fill the bellies of my guests. Whilst I had every intention of following the recipe on ‘lovefoodhatewaste’ I ended up deviating off a lot to the extent that I think it is better to describe the recipe on the site as giving me ‘inspiration’. I found that the dish to be a hit and it was polished off completely in one sitting. 2. Evenly chop the celery, leeks and mushrooms and place most of them on the bottom of the pie dish. (The dish I used was 35cm length by 24cm width). This will allow the vegetables to cook properly through when they are in the oven. 3. Cut the turkey and ham into small sized chunks and scatter over the vegetables along with the remainder of the vegetables that you put to one side. 4. 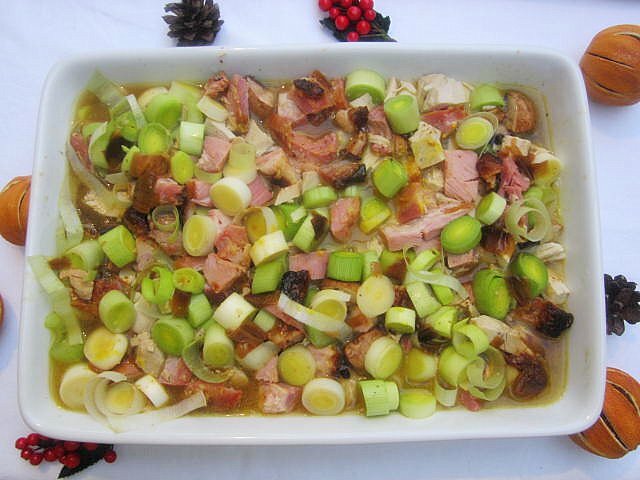 If you have any turkey stock left over use that, otherwise, use chicken stock cubes, such as knorr. I also had some juices left from the ham so I managed to combine these into the stock as well giving it a really delicious taste. Add approximately 1.5 litres of stock to the pan and warm it through completely. Place 2 teaspoons of cornflower into a small bowl along with a couple of tablespoons of cold water. Stir until the cornflour is smooth and watery and add to the stock to thicken it. As an alternative to stock, you could use a tin or two of Campbell’s chicken soup so as to give it a creamier consistency. 5. Add the stock over the meat and vegetables and using your hands try and make sure all the pieces are covered to some degree in the stock. Add salt and pepper to season. 6. To make your own pastry, simply place the plain flour into a large mixing bowl along with the cubed butter (room temperature is best). Using your finger tips gently mix the butter and flour together so that it begins to crumble. Using a knife stir in a little water into the dough so that it binds together. If you put in too much water just add a little extra flour. Once the dough has come together, form a ball and cover with clingfilm and place in the fridge for 15 minutes. 7. 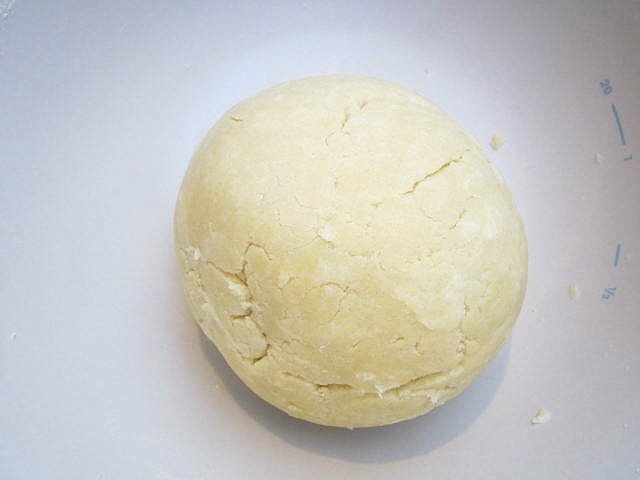 Roll the pastry out onto a cold floured surface. Once it is larger than your pie dish gently place it over the top of your filling making sure the extra pastry hangs over the sides. I find it is best to use the rolling pin to place it gently on top. Press down at the edges using your finger and thumb so that the pastry is completely secure. Using a knife cut the extra pastry that is hanging over the sides. 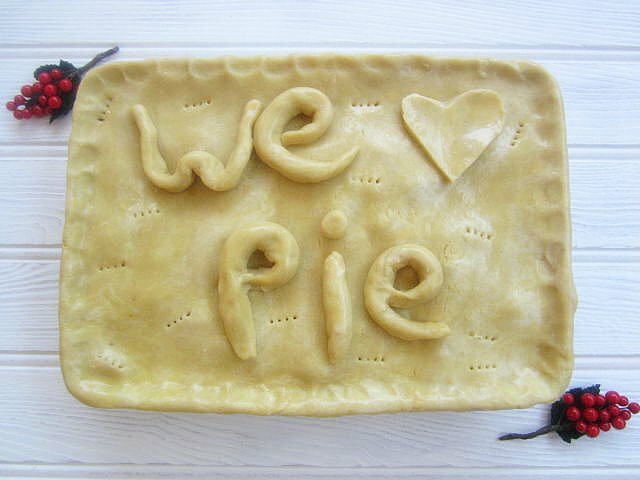 You can then get creative on the top of your pie using the left over pastry. 8. To help give your pie the perfect brown glow, gently brush the top of the pie with your beaten egg. 9. Using a fork place a few fork marks over the top of your pastry so that it can let out the air within the body of the pie when cooking. 10. Place in the oven for 30-40 minutes, checking to see that it does not brown too much. Serve immediately with peas and new potatoes. This entry was posted in Chicken, Turkey and tagged chicken, gammon, ham, leeks, leftovers, lovefoodhatewaste, mushrooms, pastry, pie, stock. Bookmark the permalink. Have you ever made this baking the pastry blind in the dish, then adding the filling and covering with more pastry? Do you know which style is more traditional? No I haven’t made a two crust pie, but I think it would be rather delicious and similar to a large cornish pasty…have you attempted to make one? 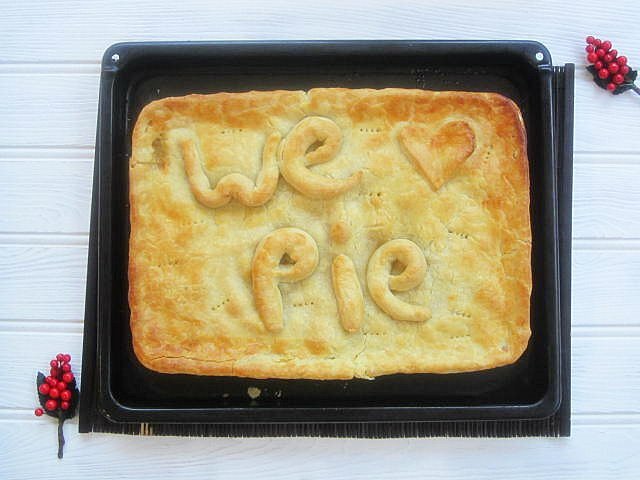 The first pies appeared around 9500BC in the Egyptian Neolithic period and my guess is that a two crust pie would have been more traditional as they tended to wrap the contents in pastry, or their version of pastry anyway. Hope that answers your questions. Happy pie making.